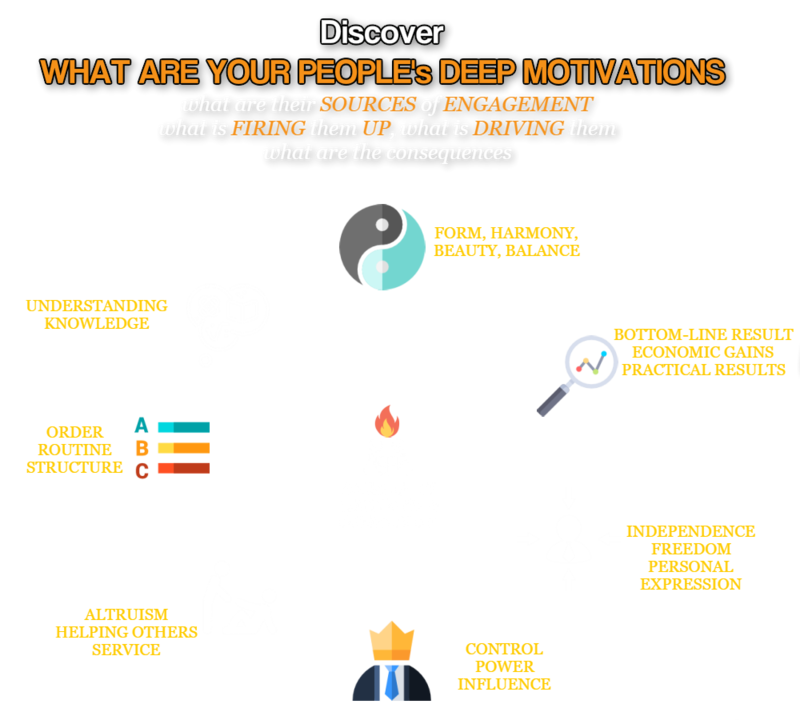 Deep Motivations / Values assessments. The why of human performance! Values help influence behaviors and actions and can be considered somewhat of a hidden motivation because they are not readily observable. Understanding your values helps to tell you why you prefer to do what you do. It is vital for superior performance to ensure that your motivations are satisfied by what you do. This drives your passion, reduces fatigue, inspires you and increases drive. Such information is vital when it comes to motivating employees, making hiring and selection decisions, understanding performance issues or anywhere that requires understanding what drives, motivates and inspires an individual. Understanding WHY someone does what he/she does is the key to understanding how to get him, her well aligned with work and in an environment that will lead to the most passion. • Aesthetic - a drive for balance, harmony, and form. • Altruist - a drive for humanitarian efforts or to help others altruistically. As a consequence, we all have our own "hierarchy of values" that makes us unique.